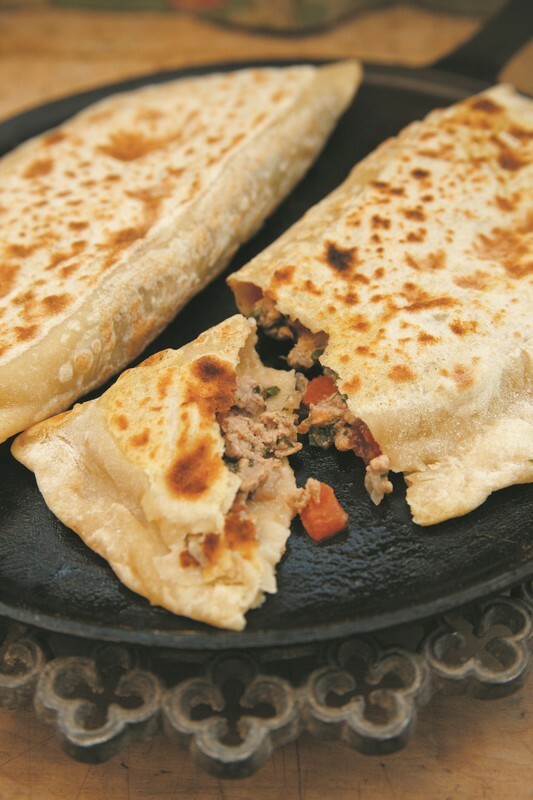 FLATBREADS contains many types of roti from my Guyanese childhood, such as flaky parathas, soft and tender potato roti and thick seasoned sada roti, as well as Turkish yoghurt dough bazlama flatbread and griddled pasties or Sac börek. YEAST BREADS, CAKES & ROLLS includes Jamaican hard dough bread, a ‘modern’ lardy cake, Central European walnut rolls (potica), Dutch Duivekater and fruit loaves, Turkish simit, Mallorcan ensaimadas alongside the sweet-and-salty brioche-like Filipino enseymadas, chocolate and hazelnut buns and more. CAKES, subdivided into Fruit Cakes, Spice Cakes, Chocolate Cakes, Nut Cakes, Coconut Cakes and Other Cakes. Think of banana cakes, layered Chilean drunken apple cake with cream, spiced Indonesian layer cake, a whole collection of speculaas recipes, Sachertorte, Engadine nut and toffee pie, Hungarian walnut Gerbeaud slices, Caribbean coconut cakes and puddings, Latin American tres leches cake, green tea sponge, cheesecakes and many more cakes from around the world. 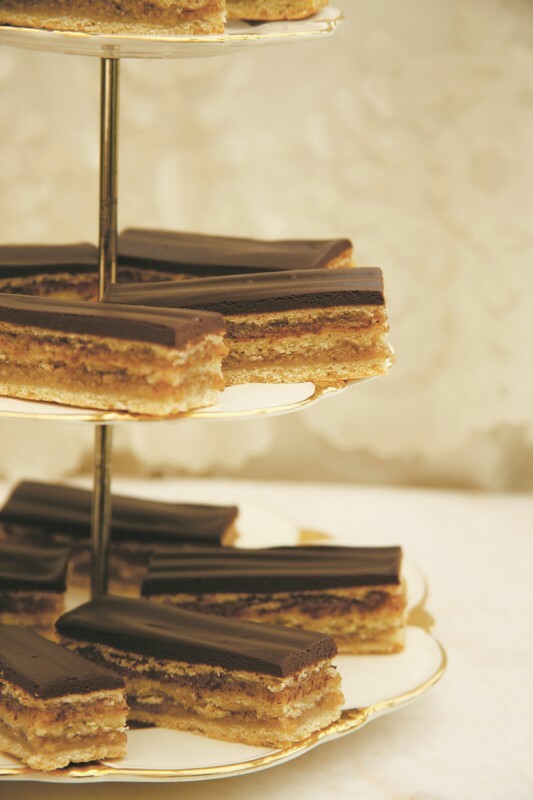 In SMALL CAKES, PASTRIES & SAVOURIES you’ll find toasted flour polvorón pastries, date-filled ma’amoul, shortbreads, almond paste delights from Holland, chocolate and pistachio sandwiches, Chinese bean cakes, pineapple tarts, meat pastries, steamed Chinese buns and even cocktail cheese biscuits. LEAF & THREAD PASTRIES means the wonderful world of baklava. Old ladies’ necks, palace rolls, nightingales’ nests, classic as well as fine and fragrant Persian baklava, stuffed rolls made from kadayif thread pastry and other delicious treats. 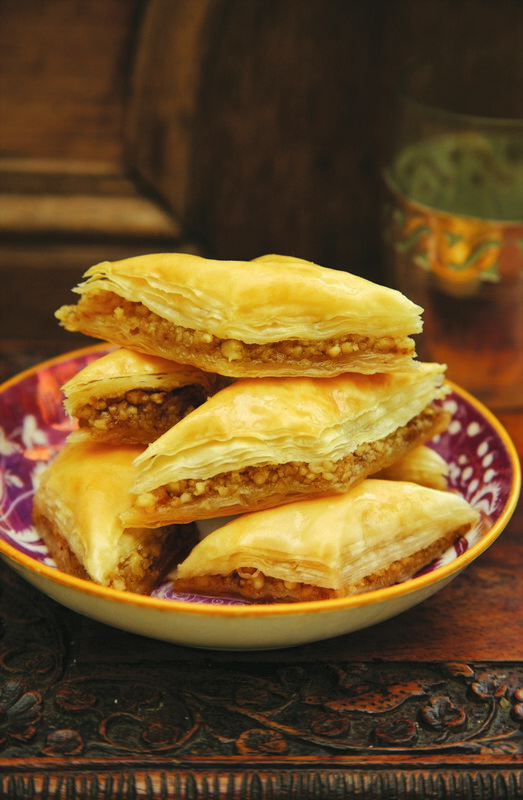 For those who want to make their own filo pastry, there are clear instructions and a simple recipe, ideal for homemade strudel and well-filled nutty baklava. I couldn’t make it difficult even if I tried, because filo pastry is such a simple thing to make. Warm Bread and Honey Cake, Pavilion 2009; Interlink h/b 2010, p/b 2013. 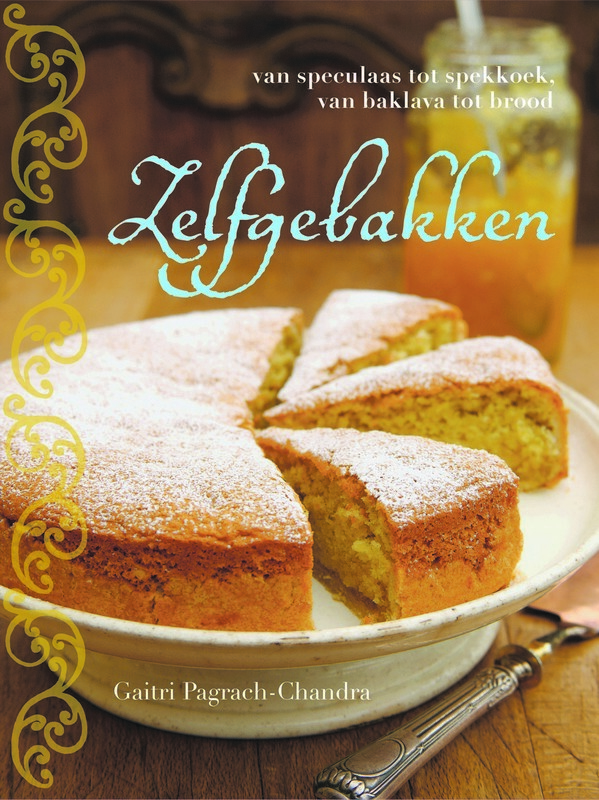 Translated into Dutch as Zelfgebakken, Kosmos Uitgevers 2011. Photography by Vanessa Courtier. ... A wonderful and unusual baking book. This is the book to hunker down with at the kitchen table on a winter’s day, only to emerge hours later smelling of nutmeg and honey. Here’s a marvel: a baking book without a single cupcake recipe. This grown-up, informative and enticing collection of recipes takes you on a world tour, from the coconut cakes of the Caribbean to sachertorte in Vienna. You can practically smell the nutmeg and brown sugar as you turn the pages. A diverse and beautiful collection of sweet and savory, with lovely stories. Novices will appreciate that Pagrach-Chandra explains not just the hows of dishes like Paratha, a flaky Indian flatbread, but the whys …. the book promises plenty of culinary trips to awaken tired palates and inspire bored bakers of any nation. The variety of recipes make this book a safe choice even for the home baker who already has lots of books. But what makes it really special is that Pagrach-Chandra writes as informatively and reliably about the history of her recipes as she does about how to prepare them. Quite simply her book is lovely to both peruse and to bake from. Pagrach-Chandra, winner of the 2000 Sophie Coe Award for Food History, has written a distinctive book that is part culinary history, part international cookbook. .... a one-of-a-kind resource for more adventurous and experienced bakers. Highly recommended. .... delicious recipes illustrating the author's rich multicultural background. 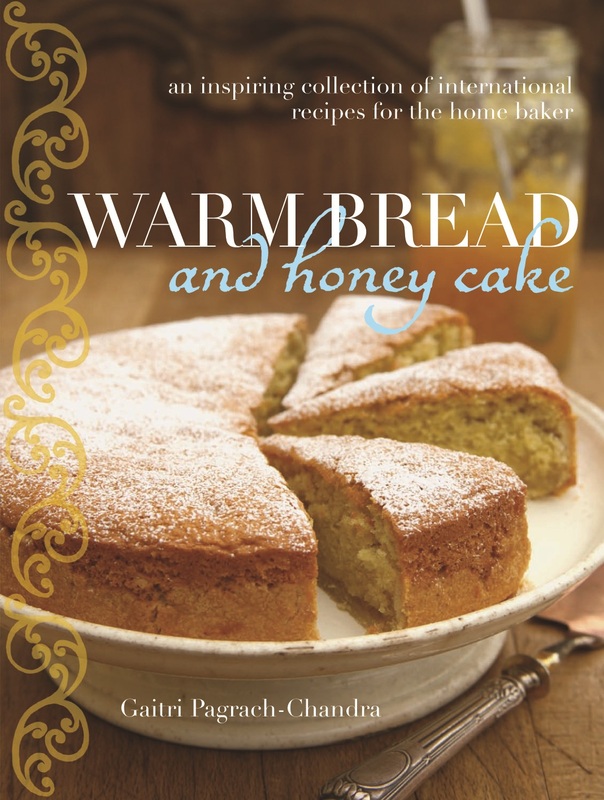 [Warm Bread and Honey Cake] is a wonderfully chosen collection of recipes - all of them so appealing and so well explained, you want to cook them all… a real pleasure to read. An attractive addition to the family of home baking books, with especial emphasis on Mediterranean sweet homebaking and on the essential ingredient for all home baking: being relaxed in the kitchen. Among the latest crop of new baking books, the hands-down winner is undoubtedly "Warm Bread and Honey Cake, Home Baking from Around the World," by Gaitri Pagrach-Chandra. ..... She has written in a friendly and informative tone -- like a favorite cousin giving you the background of a family recipe and then accurately describing the steps to a perfect result. ... "Warm Bread and Honey Cake" provides not only a fascinating read but also a collection of recipes that you -- or the baker on your holiday gift list -- will return to for years to come. Bakery recipes go straight to the heart of a cuisine. They bookend both ends of the edible spectrum: at one end the basic staff of life, in the form of plain, everyday flatbreads or sourdough loaves, and at the other, the most indulgent and extravagant special-occasion and celebration cakes. This book brings together that whole spectrum, and layers it all richly with well researched historical reference. .... An intelligent and beautiful book that rewards both reading and eating. Susan Low, Time Out London Issue 2066: March 25-31 2010; also New Delhi, Mumbai, Bangalore etc. Once in a while you come across a cookbook which, in a slow, smoldering manner, really ingrains itself into your kitchen repertoire. Makes you try something new, challenges your so-called limits, educates and inspires. Warm Bread and Honey Cake does all that and more. Richly narrated, nostalgic in parts (but never drippingly sentimental), varied, and thorough, I have enjoyed every page in this restrained and elegantly designed book. Which makes the fact that it won The Guild of Food Writers Cookery Book of the Year Award (2010) a sheer joy. Now would be the time to say that I have not been asked to promote this book by anyone. A bargain and unexpected find at TKMaxx led me to this gem and I love it enough to want to tell everyone about it. Caroline Smith at The Patterned Plate.